Retailer Clinton Cards, which is in administration, is to close almost half its stores across the UK, leading to the loss of 2,800 jobs. Adminstrators Zolfo Cooper said that it has "regrettably" decided to close about 350 stores of its total of 784. The closures include all of its Birthdays-branded stores. "In the course of this work it has become clear that the business is burdened with an untenable retail estate," it said. Clinton Cards was placed in administration on 9 May. Founded in 1968, it was the UK's biggest card retailer and before its collapse employed more than 8,000 staff. In March, Clinton Cards reported a loss of £3.7m for the six months to the end of January and said the outlook for 2012 was worse than previously thought. It had loans of £35m to banks, which were then sold on its supplier, American Greetings. While the banks had waived certain conditions for the loans, American Greetings had pressed for repayments that Clinton Cards could not meet. 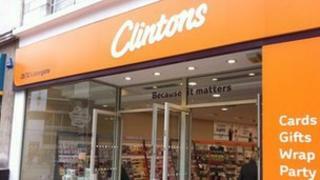 Clinton Cards has been restructuring its business to try to turn around its fortunes, including closing a number of Clintons and Birthdays-branded UK stores.